Improving an award-winning design is always a delicate task. Adding performance and value to an already highly optimised design requires vision, talent, and expertise. Fortunately for our music-loving customers, all three are on clear display in the new C 356BEE. NAD fans already know that the initials “BEE” stand for Bjorn Erik Edvardsen, our Director of Advanced Development. BEE has once again applied lessons learned from our leading Masters Series M3 amplifier to the C 356BEE. 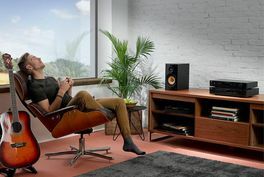 With the very high dynamic power and low impedance drive capability of our NAD PowerDrive™ circuit, the C 356BEE is able to accurately control difficult to drive loudspeakers while sounding musical, detailed, coherent and relaxed. Even at elevated listening levels, our exclusive Soft Clipping feature is there to save both your ears and your speakers from damaging clipping distortion. The C 356BEE has the lowest levels of distortion and noise available in its price class and is easily capable of embarrassing far more expensive products. To prove it we use Full Disclosure Power (FDP), the most demanding criterion for performance measurement. FDP specifies distortion under the most extreme conditions of low impedance loads and frequency extremes rather than the simple and easy 1kHz @ 8 ohms test quoted by many of our competitors. We use this stricter performance criterion because it more closely matches the demands of real music and real loudspeakers. Maintaining specified distortion at 4 ohms and at 20Hz and 20kHz is a much more difficult achievement.